Accrington boss Leam Richardson was left stunned by Lee Molyneux's impact in Tuesday's win at Rochdale which lifted the side out of the bottom two. The 24-year-old full-back has not started a game since 12 January. "That's how to react. We asked him to go and affect the game and he certainly did that," said boss Richardson. He told BBC Radio Lancashire: "Someone on the bench said to me that it was the best 20 minutes that he's witnessed in football. "The first goal was fantastic, the free-kick was up there as well and he's put a cross on a sixpence to make it 3-0. "He's been dying to play. We've had a couple of chats and he's a quality player, but we've just put a couple of good performances in so we've stuck with the same team. There are a few lads on the bench who I would genuinely like to put in." 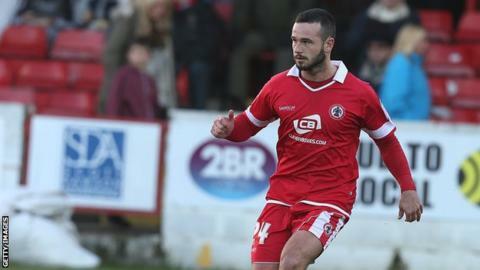 Accrington had but four points from the last two matches have moved them above the drop zone on goal difference. "It's been coming," added Richardson after seeing his side pick up their first win since 1 January. "We added a few players and it was always going to take a couple of weeks for them to come together. "The belief is there and, even though we picked up a couple of injuries, we were able to replace them like for like. "I'm not naive and we must win games, but I'm confident in what I'm doing and I'm filtering that through to the lads. "If you work hard you'll get your rewards, whether that's today, tomorrow or the next time. "But it doesn't mean anything if we don't build on it. Enjoy the win, but now all our focus is on Torquay on Saturday. We must put a winning performance in."